An enjoyable, full-on, fun-packed workshop weekend with popular tutor Vicki Swan to introduce beginners to this fascinating Scandinavian folk stringed instrument. There will be a limited amount of instruments available to borrow. This course usually fills early, so book asap! We are also planning to have a second support tutor to ensure you are well looked after! Sunday night supper, B&B is available (£35 per person) should you wish to stay a little longer! Anyone! Vicki will even have a number of instruments available for students to borrow; book early as these places are limited to 8. Not sure? For more information contact Vicki Swan 07721 519719. Vicki Swan is well known across the UK and beyond as one half of folk duo Vicki Swan & Jonny Dyer. Once known mainly for for their instrumental skills with Scottish smallpipes, accordion and Swedish nyckelharpa, they are now gaining recognition as impressive song arrangers and writers. 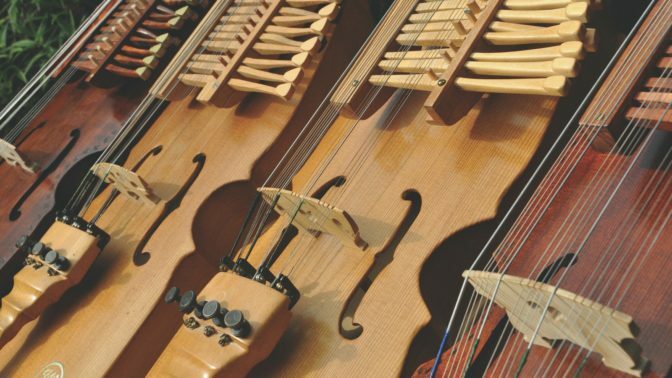 Vicki, who plays an assortment of less-than-mainstream instruments (Scottish smallpipes, Swedish nyckelharpa, English border pipes, Swedish bagpipes and more) is very much at the forefront of the current surge of interest in the Nyckelharpa in the UK. She plays as a member of the European Nyckelharpa Orchestra, runs Nyckelharpas at Halsway and also teaches internationally at festivals and events. A second tutor will be added to the team as numbers require.